Cinematographer Jayson Crothers details his approach to safely photographing a variety of conflagrations on a weekly basis. Chicago Fire images courtesy of Jayson Crothers and NBCUniversal. There’s no doubt that there is beauty in fire and the light that it produces. But fire is also inherently dangerous and unpredictable, and therefore difficult to tame. Cinematographers working with real flames, either as a photographic element or a light source, must proceed with great caution to ensure the highest degree of safety at all times. Never let your guard down around fire. 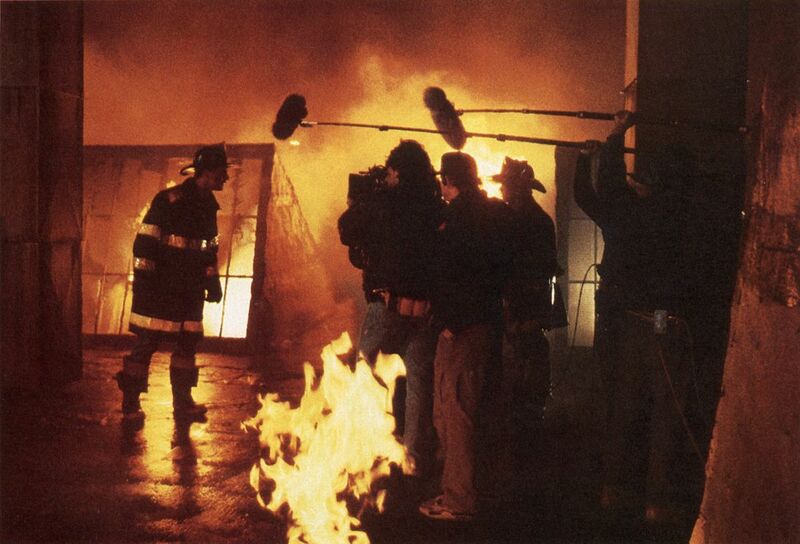 My own education regarding fire began with this publication’s coverage of Backdraft (AC May ’91), directed by Ron Howard and photographed by Mikael Salomon, ASC (see below). Although I haven’t had to shoot a blazing inferno — candles, fireplaces and campfires are more my wheelhouse — Salomon’s approach to fire photography has remained my go-to reference. Recently, though, a conversation I had with cinematographer Jayson Crothers served as an advanced class, taking my education to a higher degree. Jayson Crothers lines up a shot. The Burn Stage houses the “bones” of three different set configurations at all times: a basement, an open room that has served as everything from an apartment to an art museum, and a multilevel set for when characters need to move from one floor to another. All of the set construction is designed for use with propane fire effects; all of the set dressing is also made of metal, and any paint coating has been stripped off to avoid unwanted — and potentially dangerous — chemical vapors from being released in the set. “Every setup on the Burn Stage takes between 45 minutes and an hour to set up. Actors work on the show’s Burn Stage. Additionally, the stage has been specially configured with a custom ventilation system to help control the amount of heat and smoke present in the stage at any given moment. The ceilings of the sets are designed so that portions can be removed — without being visible to camera — in order to channel the heat and make the temperatures somewhat more bearable. Extra-large air conditioning units have been installed to help cool the stage between takes. “Shooting on the Burn Stage comes with its own unique challenges and is exceptionally slow,” offers Crothers. “On a typical day on our show, we’ll shoot seven to eight pages and might do 50 to 60 setups with two cameras [25-30 per camera]. On a Burn Stage day, we might shoot two pages and accomplish 14 setups [working primarily with a single camera] in the whole day. “Every setup on the Burn Stage takes between 45 minutes and an hour to set up,” he continues. “We design our setups to get as many edits as we can within a single setup, but they never run very long. We might be able to run a one- or two-minute take with just five or six fire elements in the scene, but if we have 15 or 20 fire elements going on, after 20 or 30 seconds the heat is far too intense and we have to stop. Most of our takes on the Burn Stage are between 20 and 30 seconds — a character runs down a hallway, kicks open a door and that’s it. Then it takes another 45 minutes to an hour to reset for the next setup. The crew always wears protective gear when working on the Burn Stage. “For obvious reasons, we take safety very seriously,” says Crothers. Crothers starts a day on the Burn Stage with a walk-through alongside Milinac. The cinematographer shares, “I’ll get a diagram at the beginning of the day showing me where the fire pipes will be and what number each one is labeled, and we go one pipe at a time, setting levels — more fire here, less there. When we set the levels, we set them individually, turning on one pipe, eyeballing its level, and then turning it off and moving on to the next one. We discuss the action around each pipe very carefully. Where will the actors be? Where will the crew be? Where will stunts be? We discuss any flame that might be close to windows, as too much heat can cause glass to crack and shatter. “Then we need to test [all of the fire pipes] at once, and a lot of complicated physics take place,” he continues. “If you have several pipes in close proximity to each other, they all wind up competing for the same oxygen, and each one can end up being significantly smaller than if it were the only pipe that was burning. Also, if one propane tank is branched off to several pipes, the pipes can all be low because the gas is being divided between them. “There’s also ceiling fire, which we affectionately call ‘brain fire,’” Crothers adds. “It’s fueled by propane that is pooled in the ceiling. Since it doesn’t have anywhere to go, it ends up crawling along the ceiling in a beautiful rolling pattern. But, depending on how the other flame bars are affecting the oxygen flow, the brain fire can be a bit unpredictable. The heat from the wall might push the air around, and suddenly that slow, rolling brain fire is whipping all over the place and becomes a safety hazard. “After a few years of doing this, we’ve gotten used to these variables,” the cinematographer offers. “We know if there’s a big wall fire that requires several pipes, the pipe that’s closest to camera should be brighter and hotter, and the subsequent pipes should be set lower so as not to compete for as much oxygen or fuel. Still, there isn’t any formula. We have to turn everything on, see how it looks, and adjust the levels accordingly — and it can still be unpredictable. To compete with both the smoke and the brightness of the flames during a take, Crothers has to work with extremely high light levels. “If I’m lighting up a daylight city backing on the stage, I’m typically doing it with multiple 18K HMIs, and we’re usually lighting the backing to an f64 or f90 to punch through the smoke and compete with the fire,” he explains. “The backing might read at f64 with no smoke on set, but once moderate smoke is added, a spot reading might reveal the backing is only reading as f8. The farther away from the backing the camera is, the more smoke there is between the lens and the backing — and the dimmer the backing might read. Once all of the elements are in play, that same f64 might read as f2.8. Crothers works with Arri’s Alexa Classic and rates the camera at 800 ISO. For fire sequences, he typically shoots between T8 and T11 to maintain good color rendition and texture in the flames. “If you open up to a T4 or 5.6, you end up losing detail and color in the fire,” he notes, “so a T8 is usually the widest I’ll shoot on the Burn Stage, and sometimes I’ll stop down as far as T16 depending on the size and scope of the fire. At those stops, a Maxi-Brute is really necessary to put out the amount of light I need to supplement the real fire. We feed [the Maxi-Brutes] back to the dimmer board and use a preprogrammed chase sequence to mimic the fire flicker. I usually use Full and ½ CTS combined on each Maxi to match the color of the flames. The set for a rooftop fire scene was built in a parking lot, where Salomon used heavy diffusion to create a strong feeling of heat. He also wetted down the tar paper on the roof set, making it look like the tar was melting and, as an added benefit, reflecting the fire.